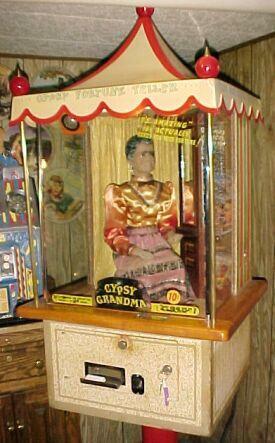 Description: Gypsy Grandma fortune teller, Genco, 5/57. 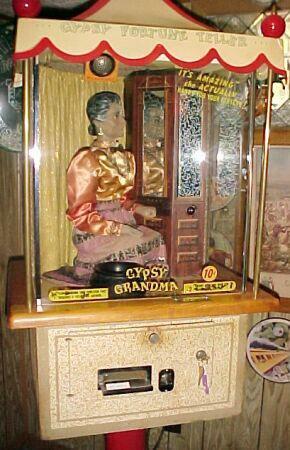 A small fortune teller with sophisticated movements (nods, turns her head, breathes). 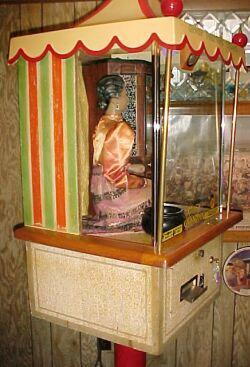 Her right hand picks-up a fortune card from the enclosure that she opens with her left hand. She brings the card in front of her, turns her head, and then moves the card over the caldron and drops it (which delivers the card to the patron). She breathes during this process too (but there is no eye movement) and turns her head left and right and nods. 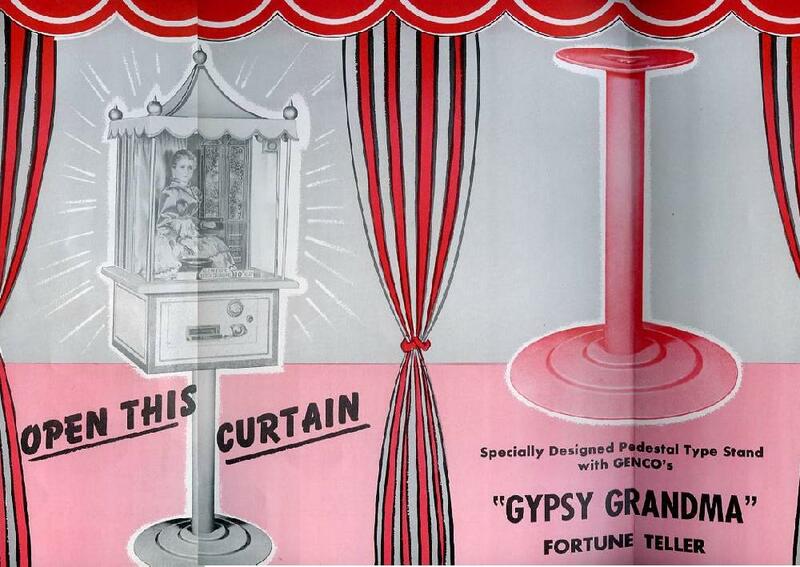 Note some Genco Gypsy Grandmas had a speaker/microphone mounted to the upper left of the front glass, and some did not. 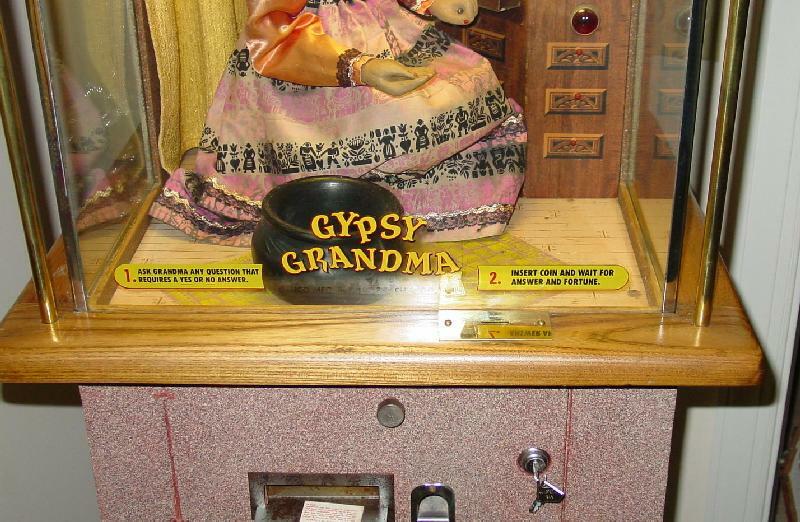 The Speaker is not functionals - it is just there to "fool" the patron into thinking they can "talk" to the Grandma (the front glass specifies that you can "ask" Grandma a yes or no question, and she will give an answer). 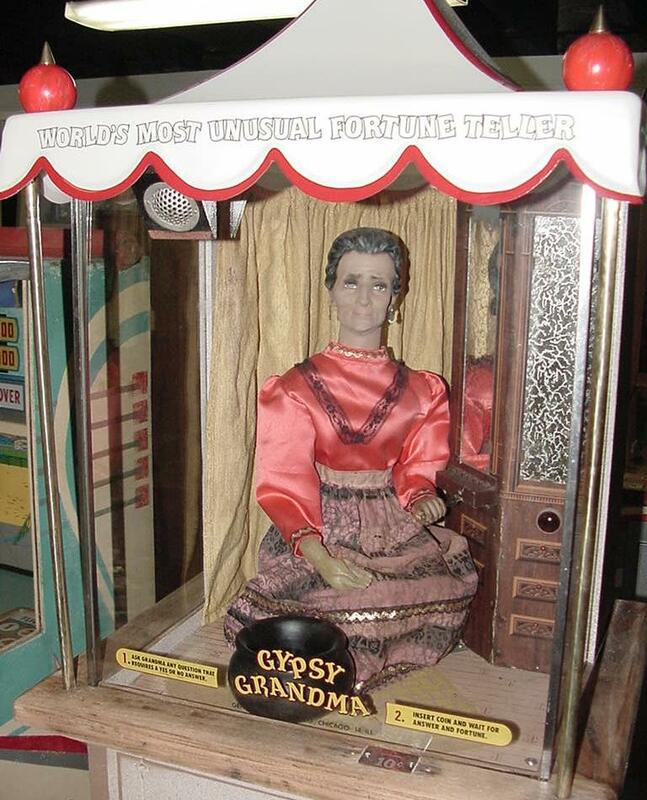 The Genco Gyspy Grandma is one of the more sophisticated fortune tellers, much more complex than the 1957 Genco Horoscope Grandma (which came out at about the same time, but delivers a horoscope in addition to a fortune). 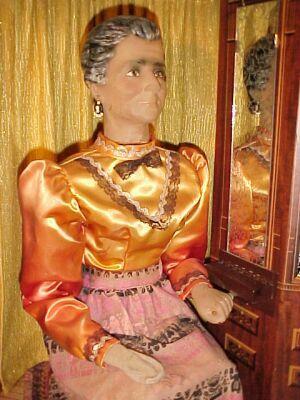 The Genco Gypsy Grandma and Genco Horoscope Grandma were two games based on the Roovers Brothers Madame Zita. 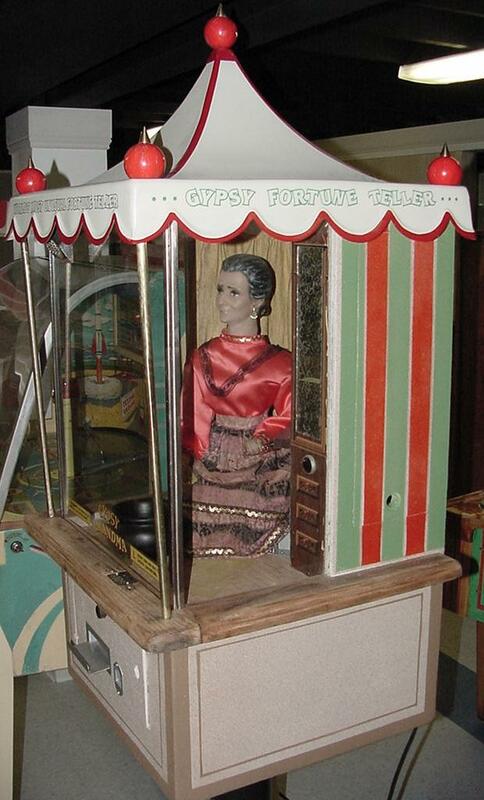 While the Madame Zita was powered by wound springs, the Genco fortune tellers used an electric motor to power the grandma gypsy. 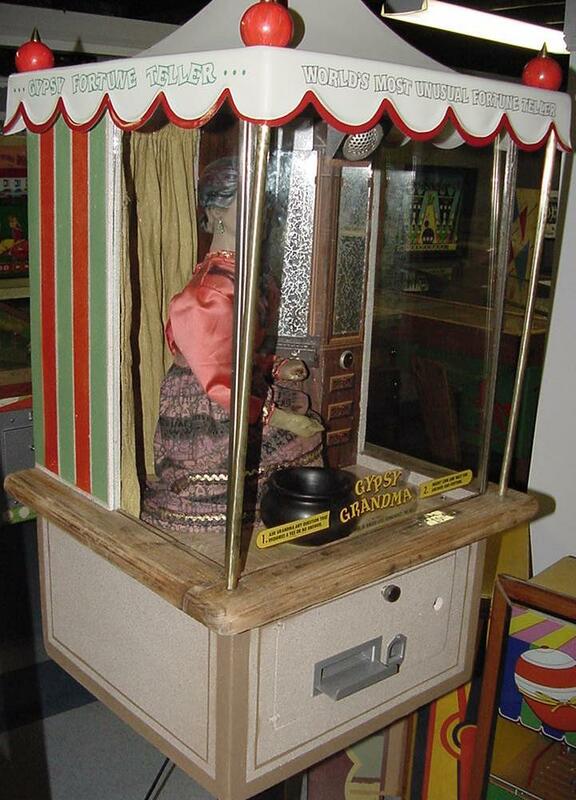 On the Genco Gypsy Grandma she would reach over, open a cabinet, turn and nod her head, remove your fortune card and then drop it into a pot, which delivered it to you. On the Horoscope, she made less movements but a horoscope was also delivered. 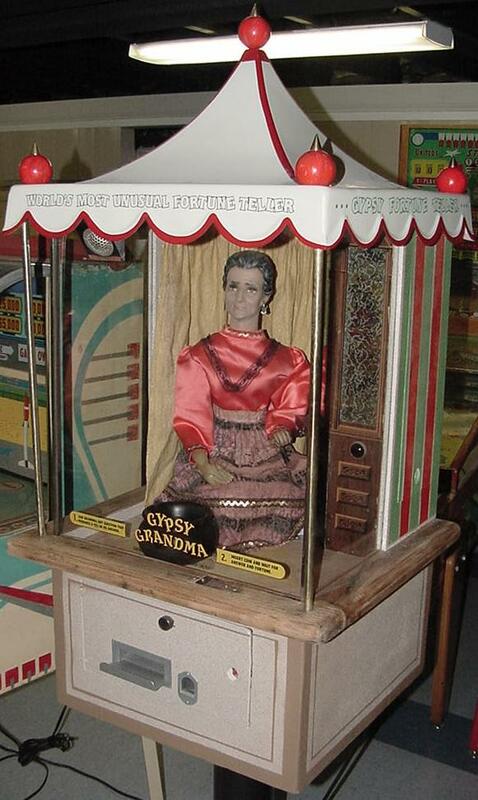 When the 1957 Genco Gypsy Grandma is found, usually the the top plastic canopy is gone or damaged. Likewise, the five 2" red (or sometimes yellow) hard plastic top balls and their associated cone-shaped (5/8d x 3/4h) brass attachment brass finials with internal threads are missing. (Lamp finials can be purchased from Klockit (item# 0070) and modified slightly to look like Genco finials.) Also the rubber right hand is often in poor condition. Often the two front 1/2" diameter brass rods (22.25" long) are damaged or gone (but easily replacable at any good hobby shop). The glass used in the Genco Gypsy Grandma is 21.25" x 9.75" for the two side glasses, and 21.25" x 18.5" for the front glass, all 3/16" thick. If you want to make your own glass decals, you can download this file here (3.6 meg). 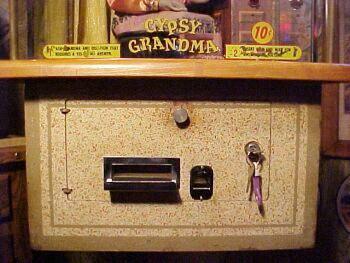 It is a ZIP file which contains all the Genco Gypsy Grandma front glass decals in PhotoShop 6.0 format. Just print them on decal paper and apply to the front of the glass. Or reverse the images in PhotoShop and apply them to the inside of the glass. 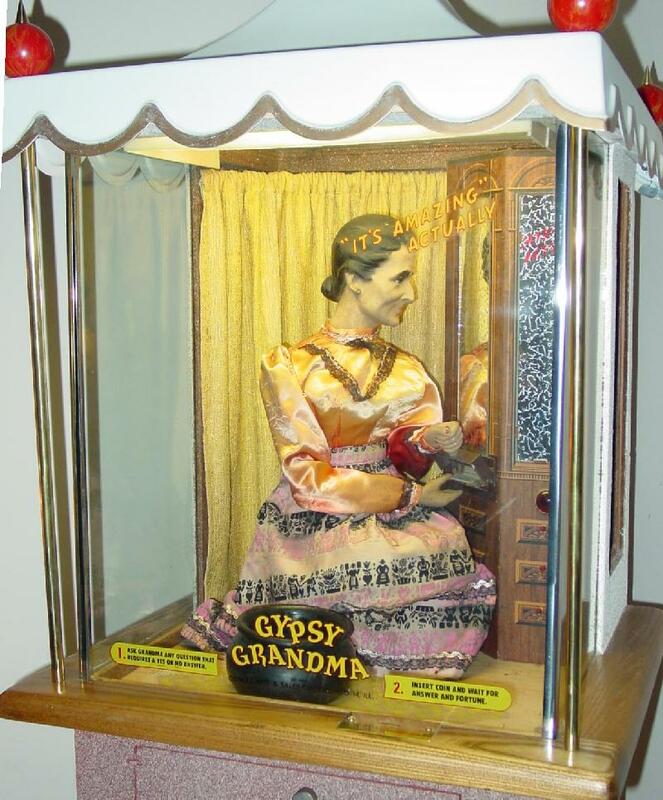 Another paint scheme is also seen on the Genco Gypsy Grandma with an off-white basecoat color, with the usual red and green pastel-ish stripes down the upper sides, as well as red borders around the lower part of the cabinet (the one original cabinet pictured below has the darker off-white with the tan stripes on the cabinet, and the red and green stripes on the side are darker and not pastel). 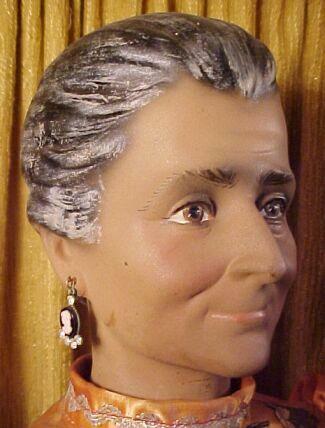 When repainting a Genco Gypsy Grandma, I found the best basecoat paint was available at Lowes and is Valspar's "Weathered Stone" #177300 Pebblestone. The brown stencil paint I used was Rustoleum's "American Accents" #7942 Nutmeg. The green side bars was Rustoleum's "American Accents" #7934 Leafy Green, and the orange side bars was GPM's Color Decor CDS-3 orange. On the colors of the grandmother's dress, the bottom Skirt is always a purple print, but the top shirt is sometimes faded red satin or sometimes a gold satin. 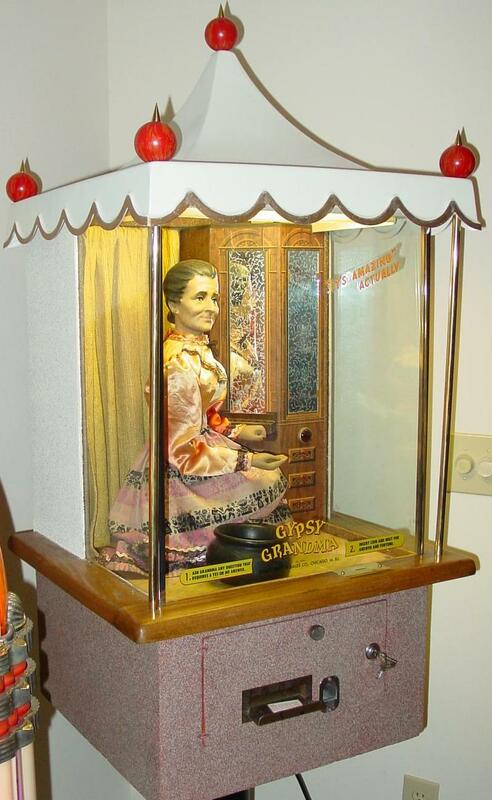 The Front Glass says either "It's Amazing" or "It's Amazing SHE Actually HANDS YOU YOUR FORTUNE" (the words in all caps are in a different font). 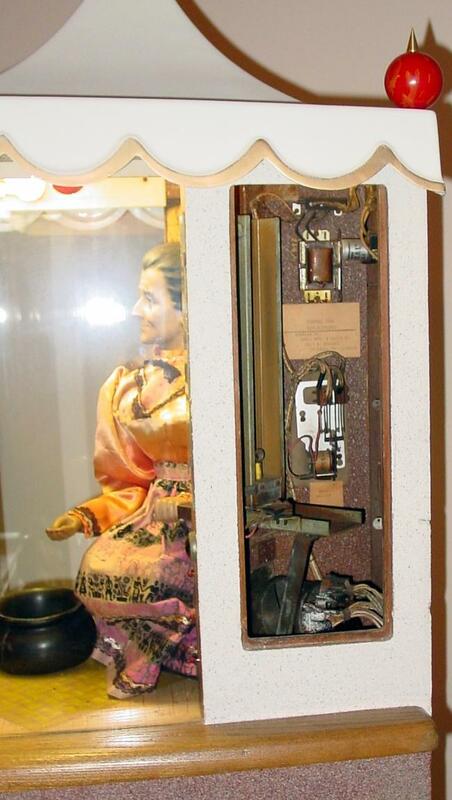 Some Genco Gypsy Grandmothers had the coin acceptors in the front door (Heath-style acceptor), yet some had the coin slot in the upper wood trim in front of the glass (like Williams pinballs of that era). 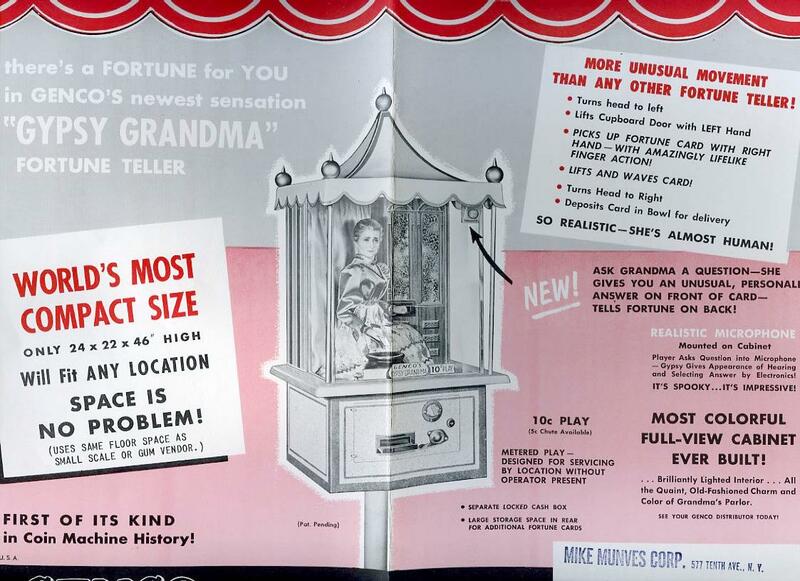 For example, the flyer shows the Heath-style coin acceptor, and the pictures below show the thru-the-wood trim coin acceptor. has a new canopy and new red balls/brass finials. 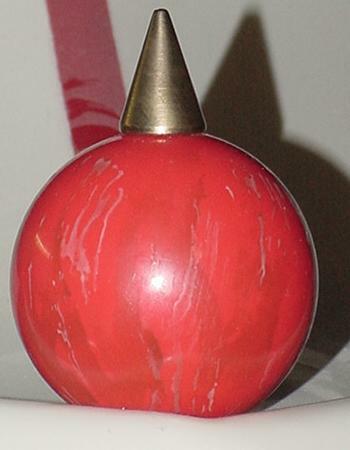 A reproduction red ball and finial. including the original cabinet paint. floor. The canopy and red balls are repros. 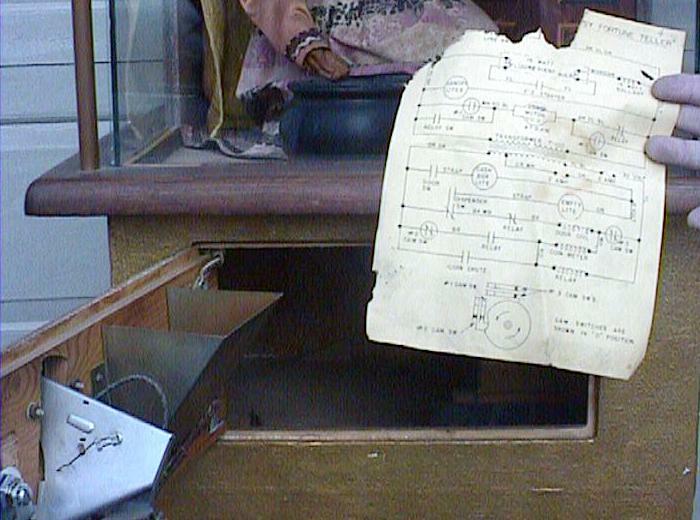 Schematic from another badly repainted Gypsy Grandma fortune teller.